Smart phones and tablets are essential to help us keep close connection with the world. 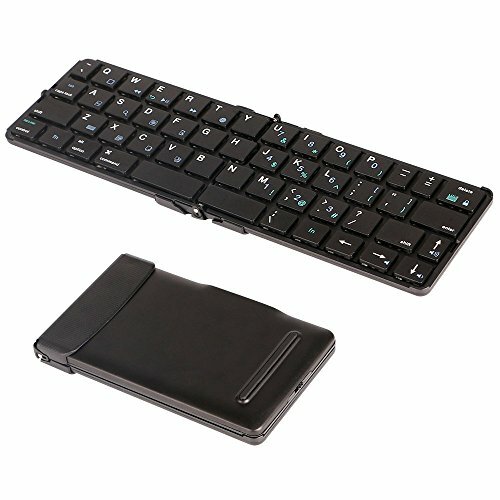 An ultra slim portable keyboard might be a good idea to help people type anywhere when needed. Ultra thin, light, compact and foldable; Probably the most compact and lightest full-size keyboard you can find in current marketplace. Typing depth (from key cap to where it stops) is 2.5mm, which is about 1mm deeper than most foldable keyboards and makes the typing more comfortable and responsive. 15mm key size and 4mm key space are similar to notebook keyboard and increase typing accuracy. Low consumption Broadcom Bluetooth 3.0 chipset ensures smooth and instant Bluetooth connection. Built-in rechargeable Li-polymer battery supports standby time up to 60 days and 200 hours' continuous working. For the sake of ultra compact and portable specialty, we changed some of individual keys on traditional keyboard like numbers and symbols into color coded combination key groupings, and added some hot keys to remote control smart devices like music play, photograph, screen shot etc. The number keys follow similar layout of right sided number keys on traditional keyboard. It only takes you a while to get used to typing numbers by holding the blue "Fn" Key at left bottom then type in the numbers. It''s that easy! Step 1: Power on the keyboard and press the pair button till the indicator next to it blinks. Step 2: Search for Bluetooth signal "BlueSmart Keyboard" on your device and select it, then you will see a 6 digits pairing code. Step 3: Press 6 digits pairing code and Enter on the keyboard. Ultra-thin, light, compact, foldable: Folded size 5.2" *2.95" *0.53", unfolded size 10" *2.95" *0.2"
Plenty of hotkeys for various function: The hotkeys allows you to conveniently control the music play, volume adjustment, photo shooting etc. If you have any questions about this product by GIKERSY, contact us by completing and submitting the form below. If you are looking for a specif part number, please include it with your message.